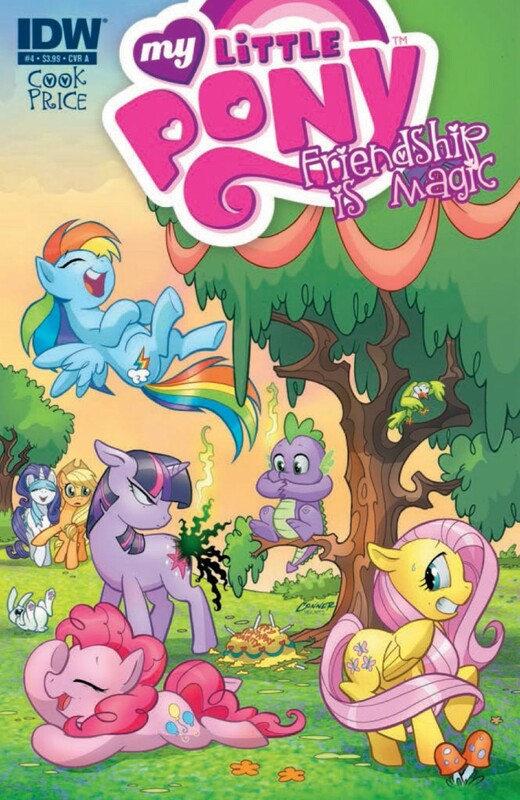 Twilight’s friends are taken captive by Chrysalis, who bargains with their lives for Twilight’s loyalty. Left with no choice, Twilight submits in exchange for her friends’ freedom. When Chrysalis reveals her true plot is to use her powers to turn Twilight against her friends, Twilight uses the power of the comet to defeat Chrysalis. Celestia arrives, revealing that for the past several days she has been fighting off giant, mutant cockatrices. In the backup story we get to see Spike and Celestia’s battle againts the cockatrices. Okay, how are they getting away with referencing not only IT, but also The Shinning, and Temple of Doom, in a children’s comic book? I think by this point it’s clear that while the main audience of the franchise is younger children, these books are definitely targeted just a wee bit more at the adult fans. That’s not to say children won’t enjoy it, in fact I know quite a few children enjoy being scared just a little bit, and some creepy references to movies they probably haven’t seen won’t be a big deal. Though I do think that part of the reason these references are okay, is because comics are a bit more relaxed than animation as far as age appropriate material is concerned. I’m a bit disappointed that we’re leaving Chrysalis behind with the end of this story. She was great in the season two finale, and she was even better in this comic. With some of the restraints from the tv show removed, the creative team had free reign to make her quite a bit more threatening, while at the same time keeping her entertaining. Her bickering with the Cutie Mark Crusaders was as fun as always. The main conflict, the battle against Chrysalis, was resolved using the standard, “I win because of my friends, love, etc.” Except in this case there was a lot more brute power involved. Twilight was able to defeat Chrysalis because she has a lot of raw power as far as magic is concerned. Take that power, and give it focus through her feelings for her friends, and you’ve got a good message for kids. Having friends is all good and fine, being skilled at something is fine, but to really shine you should use your talents to help your friends and others around you. I loved how Celestia actually had a reason for not being available. It wasn’t because she was “training” Twilight, it wasn’t because she was overpowered the one time she decided to actually do something. It wasn’t even because, as some fans have theorized, she was “trolling” Twilight. No, she was busy being awesome elsewhere. And then we get to see how awesome she and Spike were being together in the supplement at the end of the book. 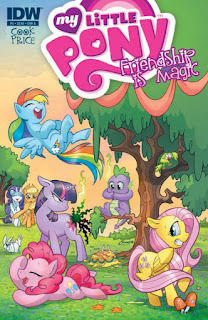 A friend of mine was reading the book, and when he found out what Spike and Celestia had been doing, he said, “Man, I really wanted to read what they were doing.” Then he turned a few more pages and boom, wish granted. By the time this review goes up, the first trade paperback will already be available. I highly recommend you pick it up, if you haven’t picked up the individual issues. It’s currently less than ten dollars on amazon. My own copy will have already arrived in the mail. If you haven’t already ordered yours, just follow the link down below and pick up a copy.